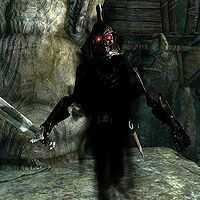 Corrupted Shades are a variety of skeleton which has more ghostly qualities than the standard skeleton. All versions have a 25% chance of dropping one sample of bone meal. Interestingly, they share none of the resistances to frost or poison that other undead do. 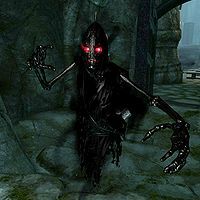 In the base game, corrupted shades are only found in the Kilkreath Ruins. They have been created by Malkoran from the casualties of the ongoing war. They can have Stormcloak or Imperial Legion model types, and have leveled souls. If Dragonborn is installed, a distinct new version appears in Vahlok's TombDB. They are weaker than the other types, and have petty souls. Despite its similar appearance, Malkoran's Shade is technically considered to be a Dragon Priest. (PS4) At close range the bow variant will put away its bow and not pull out a close range weapon, although it has its arms raised it will not attack, essentially allowing you to kill it. (Confirmed PC) ?